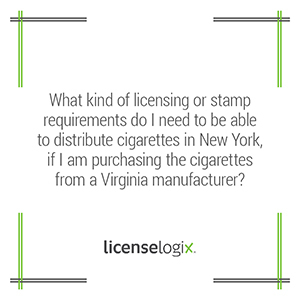 What are the licensing/stamp requirements to distribute cigarettes in NY? You must be a licensed wholesale dealer of cigarettes in New York if you intend to sell to a retail dealer or other persons for the purpose of resale. You must be licensed as a cigarette agent to purchase and affix New York State cigarette tax stamps. Cigarette agent licenses may be issued to dealers (wholesalers or retailers) who maintain separate warehousing facilities for receiving and distributing cigarettes and conducting their business, and who have received commitments from at least two cigarette manufacturers whose aggregate market share is at least 40% of the New York State market. To be a Wholesale Dealer in New York City you must first acquire a state license and then apply for a city license. New York State imposes an excise tax on cigarettes at the rate of $4.35 per package of twenty cigarettes. New York City imposes a local excise tax at the rate of $1.50 per package of twenty cigarettes, bringing the combined tax rate in New York City to $5.85. A state tax stamp is evidence that the state excise tax was paid. If you wish to affix the City cigarette and sales tax stamps on cigarette packs which are sold to wholesale dealers in New York City (Agent-Jobber), you must, in addition to being licensed by the state, be licensed by the City. For additional help you can click contact us, or call us at (800) 292-0909 for more information.